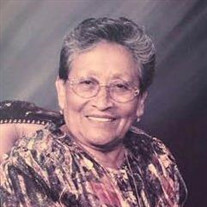 McAllen - Bersaida M. Gutierrez, 91, passed away peacefully at her home surrounded by her loving family on Sunday, May 20, 2018. She was born on December 3, 1926 in Cd. Gustavo Diaz Ordaz, Tamaulipas, Mexico. Chayita as she was known by all those whose lives she touched, is survived by six sons: Jose Elizandro, Arnulfo, Severiano, Artemio, Aurelio and Adalberto Gutierrez; two daughters: Maria (Nena) Gutierrez and Leticia Rodriguez; also surviving are 17 grandchildren and 7 great-grandchildren.